Plane Stupid - bringing the aviation industry back down to earth! Today saw the beginning of the #Heathrow13 trial of the thirteen defendants who, on the 13th July 2015, occupied the North runway at Heathrow Airport. In doing so they cancelled 25 flights and saved an estimated 250 tonnes of CO2. In doing so, they argue that they have saved lives in the face of climate chaos. All thirteen are pleading not guilty, as this action was reasonable and justified in the context of climate change. Climate defence is not an offence! The day got off to an amazing start. Around 100 supporters came to show solidarity in a demo called for by the national campaign network, Reclaim the Power. The demo began with a statement from the #Heathrow13, in which they explained why their actions were justified. They argued that the effects of climate change due to emissions from aviation are happening now and are being felt locally and globally, predominantly by those in the Global South who have least to do with causing climate change. They also stated that the failed "no ifs, no buts" promise of David Cameron further jeopardises our future. A video of the full statement can be seen here. In addition to this there was singing from a radical choir, massive inflatable #redlines cobblestones and solidarity banners with international struggles against aviation, such as la Zad in France. The #Heathrow13, then, proudly entered the court to chants of “No ifs, No Buts, No new runways!”, reminding everybody of David Cameron's previous election promise. Inside the court, the day began with a discussion about the expert witness, Alice Bows-Larkin, who is a climate change and aviation expert. Unfortunately, it was decided that she would not be allowed to give evidence in the court. On the plus side, however, this was because Judge Wright declared that the fact that aviation fuel is linked to climate change is indisputable, which is a huge statement for a Judge to make. Next, the Prosecution put forward their case. This was fairly straightforward, mainly confirming the facts that the 13 activists were: on the runway, created a structure of mesh fencing and a tripod, and that people locked-on to this structure in a variety of different ways in order to prevent as many flights as possible from taking off. A Police video was played in court showing this. Chuckles may have been heard when a polar bear on top of the tripod came into shot. None of these facts are contested by the activists. The Prosecution then called 2 witnesses: Mr Oxby - Head of Business Resilience, and Mr Thomas - Flow Manager. They mainly gave evidence about the supposed level of disruption caused to the airport. On cross examination, however, it was made clear that despite causing 25 flights to be cancelled, the impact on passengers could not be separated from the effects of weather, nor was it likely that the number of passengers supposedly affected was accurate given that most flights cancelled were short haul and therefore it is likely that passengers could be moved onto later flights. Mr Oxby claimed that Heathrow airport contributes around £7bn to the UK economy. He was unable to answer, however, if this took into account the negative impacts of climate change, for example, the £5bn cost of the recent floods in the North of England, which scientists from Oxford university say has a 40% probability to have been caused by climate change. Nor could he say if it took into account the cost of 3,000 hospital admissions every year due to London air pollution. In the second half of the day, the first two defendants gave their evidence in court. This first began with Ms Ella Gilbert who, having two climate change related degrees, brought the science of climate change into the courtroom – quite literally as the lawyers presented a huge ring-bound folder of peer-reviewed science, which Ms. Gilbert said was only a selection of the most seminal papers which have informed her decision to take part in this action against climate change. She stated that papers such as the IPCC's 2015 report laid out the science clearly; that the evidence was 'unequivocal' that climate change is 'human induced' and that the recent warming is 'unprecedented'. Thus, the need for radical action. She further highlighted the impacts of climate change on sea level, the spread of disease, agriculture, and extreme weather – all of which are going to hit the Global South hardest. She also added that that following the 2008 Climate Change Act it has been recommended that a cap on aviation emissions be set at 2005 levels. However, aviation is the fastest growing source of CO2 in the UK, and we are set to miss the 2050 targets at this rate. The second defendant to take the stand was Mr Sender, who grew up under the flight path and has lived in the Heathrow villages for around three years. This meant that he has personal first hand knowledge of the impacts of Heathrow on local health, such as the 'Heathrow Cough', the increased levels of asthma and the fact that every Londoner has their life expectancy cut short by two years due to air pollution. Judge Wright pressed both defendants on why they chose to stop emissions from aviation when other transport such as cars cause a larger amount of CO2 in the UK. It was mentioned, however, that in the area surrounding Heathrow, the majority of traffic is related to the airport and therefore cannot be separated. (Also, perhaps we should also fight roads and cars too – like the Combe Haven Defenders do!). Both defendants came across as knowledgeable, passionate and reasonable individuals. So much so that Judge Wright repeatedly stated that she had no doubt about the genuine beliefs of the activists in taking this action. The trial continues tomorrow, in Willesden Magistrates Court, with around seven more defendants giving evidence. The predicted impacts of climate change are well known by now. If emissions and temperatures continue to rise at the current rate it is likely that global temperatures will be 4 degrees above pre-industrial levels. This is double the 'safe' increase of 2 degrees, after which the changes become irreversible and catastrophic, leading to increased severe weather, sea level rise and biodiversity loss. In fact, the effects are being felt now: from severe flooding in the UK to the Arctic being 50 degrees Fahrenheit warmer than usual. The impacts of climate change, however, are not experienced equally. Those who had least to do with causing the problems are the ones who are and will continue to feel it worst. From the small island nations in the Pacific Ocean to refugees fleeing war-torn Syria (where the conflict has been found to have had links to climate change, amongst other causes), to the predicted 75 million climate refuges by 2050. Primarily the victims of climate change are black and brown poor communities in the global South, and the impacts are often worst for women. Not only are these communities feeling the effects of climate change, they have long been suffering the negative impacts of the extractive industries (oil, gas, coal and now 'unconventional sources' such as tar sands): the very industries which are driving climate chaos. Rarely do local communities see any benefit, with profits being extracted by the corporations and/or corrupt officials. The Niger Delta, for example, is a clear example of this. Estimates suggest that over the past 50 years over 9 million barrels of oil have been spilt in the Delta, equivalent to 50 Deep Water Horizon disasters. Since 2009, Shell has been responsible for over 1,000 spills, but continues to make a profit of over $15 billion in 2014. The effects of this amount huge number of oil spills has had unimaginable impacts on local communities’ health, their ability to grow or hunt food and their overall wellbeing. Communities around the world who are suffering at the hands of extractive industries and climate chaos, however, are not sitting idly by. Resistance movements are being led by those affected most. In the Niger Delta, for instance, despite widespread repression of peaceful movements (including the high profile murder of Ken Saro-Wiwa and eight others), those fighting Shell have reduced output in the region of 30 per cent a year. In (so-called) Canada, it is indigenous communities who are leading the fight against pipelines from the Alberta Tar Sands, which need to pass through territories that were never signed over to the colonial government. Blockades such as the Unis'to'ten camp are ensuring that these projects, which would have devastating impacts locally and globally, don't go ahead. Though the particular effects of projects such as the tar sands pipelines may only have been a threat in recent years, the drivers behind these projects have much deeper roots. The reason that the negative impacts of climate chaos are distributed in the way they are is linked to three intersecting processes: capitalism, colonialism and patriarchy. Not only are these systems are premised on massive inequality that take hierarchy, be it based on wealth, race or gender, as a necessary condition to function, but they have an insidious way of trying to convince us that this oppression is the natural order of things and that ‘there is no alternative’. Capitalism, with its need for never ending economic growth, requires ever increasing amounts of natural resources and energy, which always leads to increasing pollution and waste. That is why the only time in recent history CO2 emissions have decreased globally is during the financial crisis. Capitalism relies on exploitation. Exploitation of labour and of nature. Colonialism was a key driver of the shift to capitalism, with much of industrialization being made possible due to slavery. Similarly, as Siliva Federici shows, the evolution of patriarchy was key in in the expansion of capitalism and colonialism. This happened in various ways: from relegating women to the domestic sphere, which allowed for men’s labour to be exploited in industry; to taking away women's power over their reproduction, meaning birth rates could be controlled for the good of state and capital; to the horrific violence that occurred to hundreds of thousands of women through the burning of 'witches'. All of this oppression reinforced the power of the state and capital, and the techniques for doing so – for example torture and burning of witches – were often put on trial in one setting e.g. the colonies and then brought back to Europe – and vice versa. The overall result of these processes is that profit becomes more important than life, especially if you are black, brown, indigenous, a woman or a non-human organism. This can be seen clearly in historical examples such as the Late Victorian Holocaust in India, where 10 million people died of hunger whilst the East India Company exported vast amounts of grain. More recently, speculators placed bets on commodity food prices leading to price spikes, food riots and mass hunger in 2008. Naomi Klein outlines in This Changes Everything how trade and profit trumps climate in international agreements. This could easily be re-written as profit trumps life. The overall pattern of benefits being gained in the North and impacts being felt in the South continues to this day. Whether it be through 'free trade' agreements, which provides cheap goods by outsourcing production where there is little or no labour regulation; outsourcing dirty production, onto those who have the least voice; land grabbing practices, which take away space for growing food in order to produce bio-fuels or through offsetting carbon emissions by building mega-dams and displacing local communities – it seems as if only the scale gets worse. With the COP21 deal being deemed 'half assed and half baked', by former NASA climate scientist James Hansen, for a lack of any binding or enforceable emissions targets (and excludes any commitment on aviation), this trend can only continue. The costs of our unsustainable lifestyles will continue to be externalized on to those that our culture deems unimportant. This pattern will undoubtedly continue, that is of course, unless someone fights back, as frontline communities are doing. It's in this context that the climate justice movement, including the fight against aviation expansion, needs to stand in solidarity with those most affected by climate change. 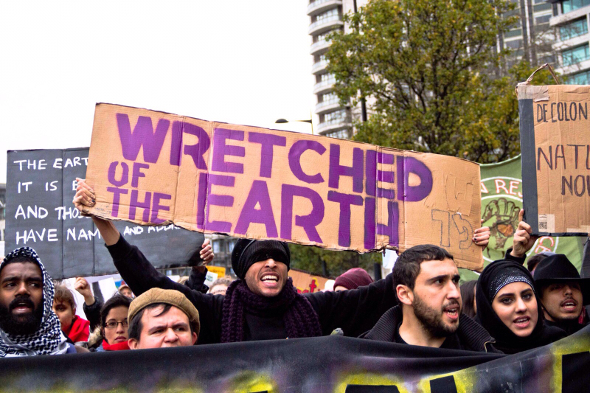 And with the big NGOs clearly needing to decolonize themselves, with organizations like AVAAZ forcefully attempting to silence the Wretched of the Earth bloc at the most recent climate march in London, it's down to the grassroots to show real solidarity. The links between aviation and continued co2lonialism couldn't be clearer. Not only is aviation the fastest growing source of CO2 in UK, which means more and more extraction, but the gulf between those who do and don't fly couldn't be wider. Globally, a mere 5 per cent of the population has ever taken a flight. So those arguing for expansion are doing so for the benefit of a tiny elite. Even within the UK, 70 per cent of flights are taken by just 15 per cent of the population. Aviation is a clear example of the North-South divide. Communities in the global South suffer twice: first from extraction and then from the effects of climate change, whilst the global North primarily uses aviation as a form of leisure or to expand processes of capital accumulation. Aviation expansion isn't even about family holidays for those who are relatively privileged in a global perspective, it's about a continued pattern of privilege for the very few at the expense of the many. This, if we are to have any semblance of justice, must stop. This means that there can be no third runway at Heathrow, no second runway at Gatwick and certainly no 'Boris Island'. No, there can be #NoNewRunways in the UK. It also means looking globally to places like Mexico. Just outside Mexico City, in Atenco, local communities have been resisting a sixth runway airport and have suffered awful treatment at the hands of the police. This airport is being designed by Fosters + Partners, the same firm that profited from the new Terminal 2 at Heathrow. Wherever the elite try to profit at the expense of people, people will be ready to resist and say no. #NoNewRunways anywhere, no more pipeline, no fracking, no coal and no more roads. In Paris we laid down a #RedLine. The limits which cannot be crossed for a safe climate and for just world. And we're the ones that are going to make sure they're not crossed. The fight against aviation must also be seen as a fight against other interconnected forms of oppression – otherwise a 'just future' is just wishful thinking. 'What we have learned as Zapatistas, and without anyone or anything except our own path as teacher, is that no one, absolutely no one is going to come and save us, help us, resolve our problems, relieve our pain, or bring us the justice that we need and deserve. There is only what we do ourselves, everyone in their own calendar and geography, in their own collective name, in their own thinking and action, their own origin and destiny. This blog was originally published on the New Internationalist blog. On Monday the 18th, 13 Plane Stupid activists stand trial in Wilsden Magistrates Court for occupying the Northern Runway at Heathrow in July 2015. All 13 have pleaded not guilty to the charges of aggravated trespass and being in a restricted zone. Their defence is based on necessity, that their actions were reasonable and justified in the face of climate chaos, which causes death and serious injury. Full details of the trial can be found here. Ultimately, climate defence is not an offence! International support from the Northern Forest Defence in Turkey, who are fighting a 3rd Airport in Istanbul, which would devastate remaining forests. Heathrow 13 on trial - but who are the guilty ones? Next week 13 people will stand trial for their role in challenging the climate crimes of Heathrow expansion. But who are the guilty ones? Ordinary people who risk arrest and personal liberty to stop carbon emissions and draw attention to the devastation of aviation expansion, or a rich business-government partnership that wants to build an unnecessary third runway that will crash our emissions targets, further damage the health of local communities and cause catastrophic climate change? Last summer, shortly after the publication of the Davies report which recommended expansion of Heathrow, 13 members of Plane Stupid occupied Heathrow’s northern runway, constructing a sophisticated fortress in the early hours of the morning, with a polar bear seated on top of an iceberg in a cage and the rest locked on in various ways. They stayed in position for six hours, causing the cancellation of a number of flights, saving hundreds of tonnes of carbon being released into the atmosphere, whilst apologising for any disruption caused to passengers. They were eventually arrested and charged for aggravated trespass and being airside without permission. The 'Heathrow 13' now face a two-week trial at Willesden Magistrates Court, starting next week (18th-29th January). All 13 have pleaded not guilty, and will be running a ‘necessity’ defence of preventing greater harm. They believe their actions were justified, necessary and proportionate in the face of the destruction and public health damage caused by Heathrow airport, and plan to draw on witnesses including leading climate scientists, politicians, prominent authors, campaigners and local residents to give evidence. Each defendant will be giving evidence, in turn from the 18th-21st January, with defence experts and witnesses giving evidence from 21st-25th January. Judgement will be given on 29th Jan at Uxbridge Magistrates Court (note change of location for final day). If convicted, the sentencing may be given a few weeks later. Possible sentences range from fines and community service to up to 3 months in prison. Prison is a real possibility, following the recent imprisonment of peaceful protestors – such as the Love Activists who occupied the old Bank of England to highlight lack of support for the homeless, and Trenton Oldfield who disrupted the Oxford-Cambridge boat race in protest of elitism and inequality – which could indicate a trend towards more severe sentencing for people taking peaceful direct action. It’s a risk the defendants have said they are willing to take, noting that a short spell in prison is still a life of privilege compared to those living on the frontlines of climate change such as low lying Pacific Island states, facing the total destruction of their homes, communities and entire way of life. Direct action is a vital part of any functioning democracy. It’s played a key role in many of the civil liberties we take for granted today such as the eight-hour working day, the weekend, women’s right to vote, equal rights for people regardless of race and ethnicity. Since the Heathrow action, the discourse around whether to expand Gatwick or Heathrow has shifted to include climate change. This is no longer a debate around which airport to expand, but whether to expand at all. When you look at the facts, it’s clearly the Government and Heathrow airport that should be on trial. They cannot be relied upon to take action on climate change, instead going in the opposite direction. The urgent need to take action is clear, given breaches of the Climate Change Act and EU limits on NO2, poor health and early death due to air and noise pollution from the airport, and increasing CO2 concentrations leading to catastrophic climate change, which is causing the sixth mass extinction event and, if action is not taken, will result in the displacement of 75 million people by 2035 and exponentially more beyond, as well as death, disease and injury to people - last year alone 300,000 people died due to climate change. Being one of the hardest industries to decarbonize, the only way to reduce emissions from aviation is to fly less. Giving evidence for the defence is Professor in Energy & Climate Change Alice Bows-Larkin on the impacts of aviation on climate change, and Associate Professor Steven Barrett on air quality and public health impacts of UK airports. Bows-Larkin’s research found in 2005 that, if aviation growth isn’t reduced, by 2037 all of the carbon that it’s safe for the UK to emit will come from aviation alone. Papers by Barrett have warned of more than 50 deaths a year directly attributable to air pollution from Heathrow. They also found that every year UK airport emissions are responsible for 4,400 cases of respiratory symptoms in asthmatic children and 2,300 cases of asthma exacerbation in asthmatic children, as well as 16,000 lost work days and 89,000 minor restricted activity days. The UK, and particularly London, has long been in breach of EU air pollution limits. Just this week, London breached EU air pollution limits for the whole year in just eight days. Environment ministers will soon be in court over inadequate plans to address dangerous and illegal NO2 levels. 93% of the population-weighted mean due to UK aviation emissions in Greater London is accounted for by airports. This means that 93% of the total aviation emissions (weighted for population) occurs in the Greater London area – and poor air quality is likely to be the dominant environmental cause of mortality in 2050 (even more than dirty water or poor sanitation). Aircraft emissions account for 27% of annual mean NOx emissions near (and 15% 2-3km downwind of) airports. Reports estimate that UK airport emissions at their 2005 baseline cause 110 deaths per year, which will likely rise to ~250 per year by 2030, even without expansion. Expansion at Heathrow would increase UK-wide health impacts due to air quality by 4% in 2030 relative to the baseline (again assuming no expansion). Aircraft emissions already result in approximately 31 deaths per year within 32km of Heathrow. The problem is not the average family taking an annual holiday, and that is not what is driving the expansion. Nor – despite what the pro-expansion lobby would have you believe – is it even business flights, which have been in decline for 15 years. What is actually driving demand for more runways is wealthy frequent flyers. The 10-15 per cent of the UK population who flew three or more times last year took a whopping 70 per cent of all of UK flights. 57 per cent actually took no flights at all, with the rest taking just one or two. And the strongest predictors of frequent flyer status? A salary of over £115,000 and ownership of a second home abroad. Not only that, the most popular destinations from the areas with the most frequent flyers are tax havens. The facts speak for themselves – this is about a rich minority living luxury lifestyles, while the rest of us pay the real cost. Five years ago David Cameron unequivocally cancelled plans for a new runway with his now embarrassingly infamous "No ifs, no buts, no third runway" pledge. But he then found some profitable 'ifs' and 'buts' and commissioned Howard Davies to produce the £20 million Airport Commission to decide not 'whether' to expand or not, but 'which' airport to expand. Nowhere in the report was the option of 'neither'. Nowhere was the real impact on the climate and local communities seriously considered. The 'Heathrow 13' group took their action two weeks after the publication of the Airport Commission and before the government’s response to the report, which has now been delayed until after London Mayoral elections. The group has been receiving messages of solidarity from groups and individuals from across the UK as well as further afield such as Turkey and France, where the fight has continued for over 40 years against the proposed Notre Dame des Landes mega-airport near Nantes. Last weekend, on Saturday 9th January, 20,000 people, 400 local farmers on tractors, and 200 bikes blocked the Nantes ringroad in protest against the building of what would be Europe’s largest airport. A forest – known as la ZAD (Zone À Défendre) – has been occupied for years to protect it from the threat of destruction by the airport project. The same story runs through their struggle – local communities, wildlife and the climate face of devastating damage in the name of needless profit. Supporters will also be outside Willesden Magistrates Court on the first day of the trial (Monday 18th January) for a solidarity demo organised by allies at Reclaim the Power. The theme is RED lines - lines which represent minimum limits for a just and liveable planet; lines that global leaders inevitably crossed in their genocidal deal, signed in Paris, and which Heathrow would cross in the building of a third runway. Defending those red lines is not a crime, and the Government has shown that it can’t be trusted to take action. The facts speak for themselves – it’s new runways or a safe climate; we can’t have both. Plane Stupid will be covering the court proceedings on Facebook, Twitter and their website with daily updates. Support the #Heathrow13 by sharing updates on social media and/or come down to the court and join the solidarity demo on Monday. The Paris climate agreement text has now dropped mention of international aviation and shipping. The weak statement that has been removed only said that parties might “pursue the limitation or reduction of greenhouse gas emissions” through ICAO “with a view to agreeing concrete measures addressing these emissions, including developing procedures for incorporating emissions from international aviation and marine bunker fuels into low-emission development strategies.” Even that has gone, so there is no ambition for CO2 regulation. Transport & Environment (T&E) says this has fatally undermined the prospects of keeping global warming below 2°C. The CO2 emissions of these two sectors amount to about 8% of emissions globally. In recent years their emissions have grown twice as fast as the those of the global economy – an 80% rise in CO2 output from aviation and shipping between 1990 and 2010, versus 40% growth in CO2 emissions from global economic activity. Their CO2 is projected to rise by up to 270% in 2050. They could be 39% of global CO2 emissions by 2050 if left unregulated. After 18 years of being supposed to come up with measures to tackle aviation emissions, ICAO has done almost nothing – and little is expected of it. . The dropping of international aviation and shipping emissions from the draft Paris climate agreement published this afternoon has fatally undermined the prospects of keeping global warming below 2°C, green NGOs Seas At Risk and Transport & Environment (T&E) have said. As the emissions from these two sectors uniquely fall outside national reduction targets, they require an explicit reference in the agreement. If treated as countries, global aviation and shipping would both make the list of top 10 emitters. In recent years their emissions have grown twice as fast as the those of the global economy – an 80% rise in CO2 output from aviation and shipping between 1990 and 2010, versus 40% growth in CO2 emissions from global economic activity – and they are projected to grow by up to 270% in 2050. [See Professor Bows-Larkin link below]. The Kyoto Protocol tasked the UN agencies that regulate these sectors, the International Civil Aviation Organisation (ICAO) and the International Maritime Organisation (IMO), to develop measures to tackle their emissions. Now, 18 years on, these agencies have failed to do so, and rapid emissions growth from these sectors is set to make a 1.5/2°C target almost impossible to achieve. Aviation accounts for about 5% of global warming, and CO2 from shipping is about 3% of the global total. Both sectors are among the fastest growing sources of greenhouse gases at a global level and could be responsible for 39% of world CO2 emissions in 2050 if left unregulated, according to a scientific study published last month by the European Parliament. The UK government is keen to say that aviation carbon emissions will all be dealt with at the international level, and so UK airport expansion is possible – it will all work out fine. The Paris agreement fails even to include mention of international aviation, or to put any pressure on ICAO to get on with developing an international mechanism for regulating aviation carbon emissions. That will mean there is even less likelihood of a proposal or plan by ICAO to take effective measures to deal with aviation carbon emissions. This government cannot depend on it, to take care, painlessly, of growing aviation CO2 – particularly not from an extra runway, which will only increase overall UK carbon emissions. Direct action works! That's why we do it. Our disruptive direct actions this year, combined with more conventional campaigning by other groups, have scored a big win against the pro-aviation expansion lobby , with the recent government announcement that the decision on aviation expansion is to be delayed another 6 months. But after direct actions comes the court case, a tedious, sometimes costly and often lengthy process. Please support the Plane Stupid activists and community defenders at their court appearances, court solidarity means a lot when people are up against the unjust legal system, which penalises climate defenders as 'criminals' whilst protecting the interests of the rich and those who destroy nature and, in this case, inflict misery on the communities around Heathrow Airport. Heathrow tunnel blockaders and local residents have their first court appearance, see details of their action in November 2015. 13 activists who occupied Heathrow Airport in July 2015 have their trial. The trial will last 2 weeks. All 13 activists are asserting their right to defend the climate and the communities negatively impacted by Heathrow, and are pleading not guilty. See details of their action in July 2015. The nearest Tube station is Neasden, get directions. Bring cake and banners, or just yourselves!